customer loyalty is easily nurtured through email marketing. all of us as professionals do it - it's part of the job. but this morning, i got one that really wowed me. the subject line (take $7 off) isn't that great of an offer, but it's not the typical save $10 or 25% off, and plus i love crabs. i confess i looked at this email not once but twice as i triaged my inbox this morning. the pre-header is what got me though..."birthday from joe's". my birthday is in july, not january - but it did exactly what they are supposed to do - engage with the email. at first, i thought, well joe's is turning 7 this year (they aren't), and this was their big birthday promotion - take 7 bucks off a meal. okay, that's fair, not a big promo, but 7 bucks is 7 bucks. then i thought, well wait...if this is my birthday card from joe's my personal information is wrong, and i need to update and if i do, i might get another one of these in july - double score. i opened it. i began to drool just looking at it and then the headline caught my attention: "half birthday, full belly". this email wasn't an example of personal information mismatching; this is actually personalization on a profound level. sure, the email is a huge graphic that doesn't say "dear kirk" and the image isn't driven off of the last meals eaten that are associated with my frequent dinner card (that sentence pains me to write like you would not believe, that i have a punch card with joe's). but what it does say is - we know your birthday, because of that we can calculate your half birthday, and no one sends out half-birthday cards. the subject line is good enough to get me to read the pre-header. 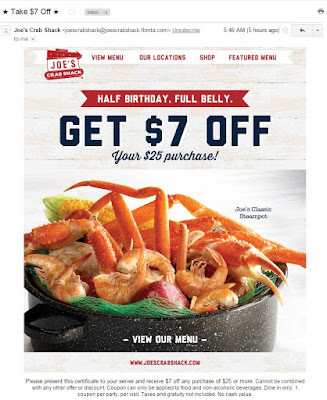 joe's could have easily used 25% off or take $5 off, but they went with an odd number that you don't see very often, what would be better is if this dollar off was 7 because july is the 7th month. the pre-header talks about birthday without saying "happy birthday" or "celebrate your birthday" and subscribers love birthday emails. the content is visually appealing (to me at least) and then when i got past the visual, i saw that they were sending me a half-birthday greeting - something i have never gotten before from anyone. what's even better about this email? unlike your normal birthday emails that come either the week of your birthday or the month of your birthday, this one came on the day of my half birthday. so not only was the email personalized based on my demographic data, but it was sent on that day because of the data, and not "around the data". in my previous blog posts i have talked about how we should respect "big data". we should follow a set of marketing ethics - especially when personalized content can begin to get creepy and make the consumer feel like they are being stalked. but this email is a great example of how to use personal data to engage your customer and create that brand loyalty that we all want. and for what it's worth, as i have told people in the office today about this great campaign, they have all wished me a happy half-birthday. so a picture of a pot of crabs has not only made me happy about getting a great email, but the story to my co-workers have made me feel like the "birthday boy" today. great job joe's crab shack!